Three hashtag movements boost DL Down3r’s music to new heights! DL Down3r’s song “Suga Boom Boom” has been making massive waves lately, as have his other songs! But there’s no denying the sheer gravitas that “Suga Boom Boom” holds over both the fanbase and any new listeners! It’s the kind of catchy track you can easily nod your head to, and if you listen closely, the meaning in its lyrics will be sure to give you pause for thought, especially if you or a loved one have experienced the trials and tribulations of addiction. Given how much it gets stuck in your head, as well as touches the hearts of those who listen to it, especially those who have experienced its subject matter first or second hand, the team at Blue Pie and DJ Central have come up with an idea to unite the community under the message it brings. Three hashtags have acted as the flagship for Down3r’s promotions lately, as conceived by our Social Media Manager- #SugaBoomBoomReviews, #SugaBoomBoomCovers, and #SugaBoomBoomTribute. Each of these serves a different function within social media feeds, and results have been impressive and exciting thus far! #SugaBoomBoomReviews is a hashtag for those who have something to say about Down3r’s work- either the titular “Suga Boom Boom” itself or any general work he’s done, but of course we’d love to hear what you think of his most-known song especially! Write something compelling about the beats above, or about Down3r himself, and tag it with the hashtag #SugaBoomBoomReviews when you post it to us. Particularly interesting reviews have a chance to make it onto the DJ Central newsletter, our social media posts, or an article on one of our websites! Send em in, wordsmiths! We need your thoughts and opinions! #SugaBoomBoomCovers is for those with more of a musical talent than a writing talent. We want you to cover any song of Down3r’s that you vibe with, but especially “Suga Boom Boom”, as of course, it is the most well known song! We’ve already got some incredible covers coming our way, so why not contribute your own flow and style to them and show us what you got?! Particularly good posts with this hashtag sent to us have a chance to make it into DJ Central season 6… you wanna be a TV star?! You want thousands of fans to stream your cover into their homes once the series is complete! Start submitting those covers ASAP! #SugaBoomBoomTribute is for contributions that don’t fall under either of the above two hashtags. But just because it’s a miscellaneous pursuit doesn’t mean that it isn’t gonna be as talented as you can possibly get… check out this amazing hula hoop dance from Sunsiren to Down3r’s “River” remix! But why just one? We have TWO hula hoop routines to some of Down3r’s greatest hits right here! Maybe a “Suga Boom Boom” hula dance is in the works for Sunsiren next… Or maybe some new work is gonna come from you! Send us your tributes to Down3r himself or “Suga Boom Boom” specifically and tag em with that hashtag, and we’ll feature those too! But say that you don’t wanna post your work publicly with a hashtag? Fear not, just chuck us your work in an email attachment to content@bluepie.com.au with the appropriate hashtag as the subject line, and it’ll be put through with no fuss. No matter how you like to create content, there’s a niche for you in this hashtag triple threat, so get submitting and get famous, and keep bumping “Suga Boom Boom” with pride! As of now, the competitions will be running indefinitely, but that’ll change eventually… so hit us up with your best shot as soon as possible! Dream big, you got this! This entry was posted in News on March 13, 2019 by bppdjcentral. The Doctor Is In- MC Breed making waves with “The Fharmacist”! MC Breed is throwing down on Spotify and hundreds of thousands of people are tuning in to listen! Listen to this hard hitting flow. MC Breed ain’t afraid to pull punches and it’s clear that this is true here too. The album dropped just two years ago and it’s already grabbing massive clout on Spotify! Check out those numbers! MC Breed’s been making huge waves with his number one track, “Gotta Get Mine”. It’s already up to over 4 million plays! We’re sure with this level of quality, all the tracks on “The Fharmacist” will follow suit eventually. 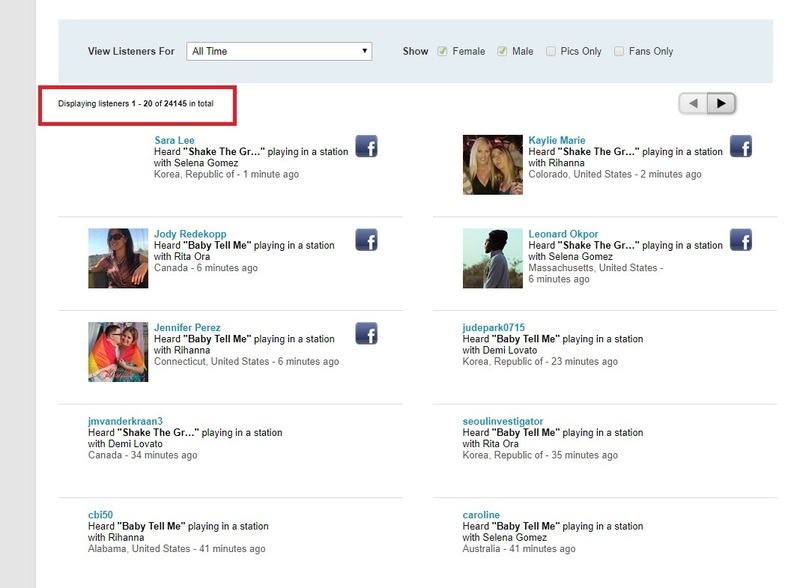 The number one track currently on the 14 track album is “Lets Go To The Club” with over 100 thousand plays! Only time will tell, but with how fresh MC Breed’s flow is, and how competent Christopher Light Records is, we’re pretty confident that it won’t be long! Check out MC Breed’s Spotify by clicking here! This entry was posted in News on March 12, 2019 by bppdjcentral. Zya Mou continues to surge in growth! Zya Mou has increased her listener fanbase on the Radio Airplay and Jango networks to over 24,000 new fans! And it’s little wonder that this has happened, considering Zya’s past with her history of creating techno bangers! The results are clear from people gradually discovering Zya through her growing social media presence and also from recalling her amazing past work- it’s crazy to think we’re working with someone who opened the Chinese Olympics! Zya doesn’t show any signs of slowing down, and it’s a good thing too- a repertoire like this deserves to be noticed in the spotlight! If you wanna check out Zya’s music for yourself, we have a bonus EP of one of her latest works here, Shake The Ground! Get ready to dance… because once this one comes on you won’t be able to resist. Or, if you’re extra interested and wanted to peruse a Spotify playlist of ALL her work, we also got you covered! Check it out! This entry was posted in News on March 11, 2019 by bppdjcentral. sixeightw0lf donates royalties to Autism Australia! 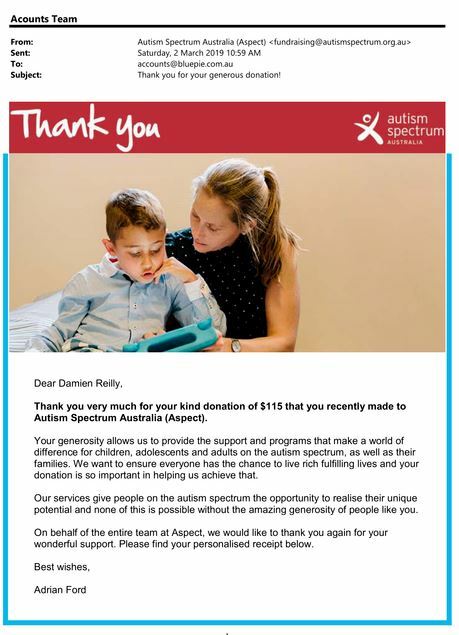 sixeightw0lf, one of our newer sign-ons at DJ Central and Blue Pie Records, has selflessly donated his royalties to Autism Australia. This selfless act has pleasantly surprised us all, to the point that we have also contributed to his donation, topping the total amount off at $115. As Aspect themselves say, “Autism Spectrum Australia (Aspect) is an Australian not-for-profit provider of services and supports working with people on the autism spectrum and their families. From diagnosis and assessments, early intervention and therapies, to specialised schooling, social groups and employment mentoring; Aspect provides advice and support for the whole family throughout the life stages, from the early years to adulthood.” That quote was sourced from their website, which you can check out for yourself by clicking here. Damien of Blue Pie and sixeightw0lf are proud to have donated to such a noble cause, and all the Blue Pie and DJC staff would like to extend their thanks and applause to sixeightw0lf for thinking of it first. The man can produce some bangers that amass thousands of plays on Soundcloud and Spotify, but it’s good to know he can produce compassion of this level as well. If you’d like to know more about sixeightw0lf check out his Soundcloud or have a listen to his latest Spotify hit below, Siege! Paddy Duke is the latest Tassie star, and he’s hunting for venues in Queensland! Tasmanian DJ / Producer Paddy Duke has a passion for dance music, and has been growing to both the international and Australian markets at an exciting rate! Clubbers of Australia know his name far and wide. Paddy is half of the new duo known as Plug’nPlay and has been rocking Clubs and festivals with the freshest tracks. In September/October 2019, their discography surged in popularity with the peaking track “Paddy Duke – F*ck feat. Brian Mannix (The Uncanny X-men)” hitting no.1 in South America, Poland and no.4 in the European charts! They’ve also been nominated Tasmania’s best D’n’B as a part of the homegrown series 2015. Clearly, any genre is not a challenge when it’s all about creating the best possible vibe and experience for any environment. You wanna hear some for yourself? Check it out here! Nice, right? Well, Queenslanders, you’re in luck- Paddy Duke has now just moved to Qld and he wants to be a part of your venue, upholding a residency to cater for your Clubbers. He has a colourful history holding existing residencies too! Just look at these names. The clout from these places in and of itself is enough of an accreditation! But that’s not all. Paddy has over a decade of experience in the scene and has acted as supporting DJ for an equally impressive list of acts! What a list, what experience! Sirius B Recording and Dennis Jones are lucky to have Paddy signed on. As will any of you QLD hosts who need someone to rock their venue! If you got a booking or remix request, just email it to producer_pd@hotmail.com to get started! This entry was posted in News on March 9, 2019 by bppdjcentral. Who remembers Sunsiren’s last outing into the musical territory of Down3r?! We bet that it left an impact on at least a few of you with how graceful and awesome it really was. Last time the Canadian hula hoop dancer danced to DL Down3r’s cover of “River” by Ed Sheeran and Eminem, and now she’s bringing the heat to “You Ain’t My Homie”, which is available now on Spotify! Check out her skills below! Sunsiren has been going all out lately with her talent, so much so that we decided to add a third hashtag to our Down3r themed hashtags- #SugaBoomBoomTribute! Be sure to click HERE to discover how those three hashtags could get YOU on season 6 of DJ Central! If you have a creative expression for something Down3r has done, or have something to say about his work, or want to cover the work itself with your unique flow, be sure to check it out- it’s right up your alley! Sunsiren is currently leading the pack in terms of creative contributions to the hashtag movements and we just had to showcase her again. You want in?! Send us your content with those hashtags! Her dancing is graceful and stylish, and we’re sure there’s plenty of other talent out there just waiting to be seen. Rise to the challenge like she has!